Deadly bushfires raged on in southeast Australia on Sunday despite cooler temperatures and scores of firefighters trying to control the flames. At least 35 people have died in the fires, authorities said Sunday “Unfortunately those numbers will increase as we move through the day,” said Kieran Walshe, deputy police commissioner of the state of Victoria, told CNN on Sunday, adding that police are investigating possible instances of arson. “We do believe some of the fires are the result of human intervention,” he said. “When you look at the way fires started, you can clearly see it’s not possible for a natural ignition to occur.” Watch how fires, heat threaten residents » A third of the deaths occurred in the Kinglake area about 50 miles (80 km) northeast of Melbourne. Still, despite earlier reports, the fires have not posed a significant threat to more populous areas, including Melbourne, as they sweep across rural outskirts of southeastern Australia, Walshe said. Photos: Deadly bushfires rage in Australia » The prime minister’s office confirmed to CNN Sunday that troops will be deployed to help fight the fires. By Sunday afternoon, eight major fires were burning through Victoria, destroying hundreds of thousands of acres, said Daniel Connell, spokesman for the state’s Country Fire Authority. 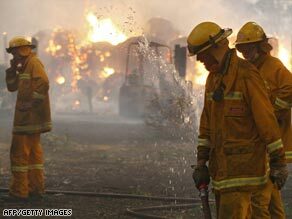 The largest blaze has centered around Kinglake, where 100,000 hectares (247,000 acres) have burned down. Another fire ravaged 90,000 hectares in Churchill, about 160 km (100 miles) southeast of Melbourne. Officials say this year’s brush fires in southeast Australia could become the worst since fires in 1983 that killed 75 people. In Victoria, 30 blazes were registered in 30 hours, said Fran Ludgate with Australia’s Fire Protection Association. The Victoria Herald Sun newspaper reported Sunday that at least 100 homes were destroyed over the weekend, critically injuring one person who suffered burns to 50 percent of his body. Sharon Merritt, a technical officer with Australia’s Fire Protection Association, told CNN there had been dry thunderstorms — with no rain — in parts of the region and there were concerns that lightning from them could ignite more fires. “Today is probably the worst day we’ve had for fires,” she said. Walshe said temperatures had cooled overnight into Sunday, but that winds remained a major threat to spread fires. The New South Wales Rural Fire Service asked residents to remain indoors and close all windows, as winds continued to push smoke from the bush into the Sydney metropolitan area. Sue McMahon thought she could stay in her home as wildfires burned, but changed her mind after taking a look at the blackening sky in Victoria. “Combined with the noise and the smoke and the blackness, I don’t think I can do it,” the Tinumbuk resident said. Video from the scene showed people trying to stamp out fires with towels and clothes. In some instances, people waited too long to flee the scene and were trapped in their cars, a police spokeswoman said. Accompanying the flames is one of the most powerful heat waves in memory, with temperatures in parts of Melbourne reaching 48 degrees Celsius (118 degrees Fahrenheit) in the last few weeks. Dozens of heat-related deaths have been reported. By Sunday, the temperatures had dropped to the mid-20s in the area. The fires were being fought mostly with aircraft, except in areas where homes were at risk, authorities said. In northern Australia, 60 percent of the state of Queensland was flooded, officials reported, and residents were warned to be on the lookout for crocodiles in urban areas.